Electrical Under Floor Heating Mats for Wet Room Floors. 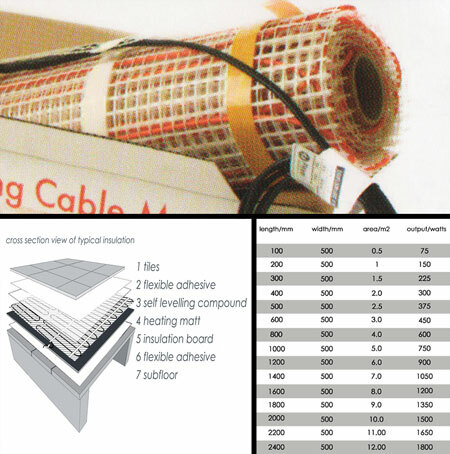 Our under floor heating mats have the heating elements woven into a mat allowing for easy and quick installation .The mats are simply be rolled out on to the floor and covered with a latex self levelling compound prior to tiling over. Our heating mats are supplier in both 150 watts per m2 or 200 watts per m2 depending on heat output required. We also supply flooring insulation and digital thermostat / timer controls. * 10 year product guarantee.